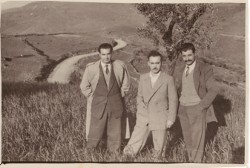 Above: With my friends, Nikos Ralidis and Antonis Tzortzis, just outside our village. Above Right: We are walking near our village’s Statue of Liberty. 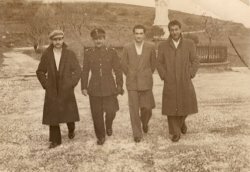 I am the one with the cap, while the others in civilian clothes are the Tzortzis cousins, Kostas and Antonis. Above: With my wife, Stella, and our grandchildren, Panayiota, Anna, Efstathia, Aliki and Styliani.